Two pilots were injured on Thursday, Nov. 30, when an R22 light helicopter crashed at Truckee Tahoe Airport. 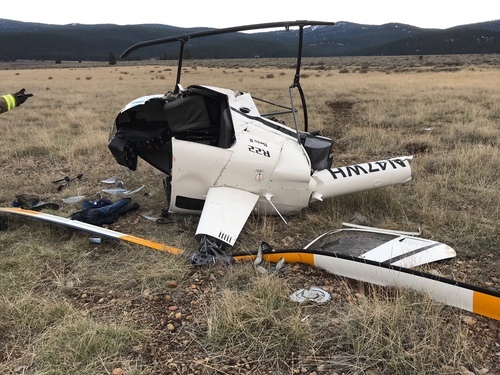 Two commercially rated pilots were injured on Thursday, Nov. 30, when the helicopter they were in crashed at the east end of the Truckee Tahoe Airport. The incident, which happened about 3:40 p.m., involved an R22 light helicopter (registration No. N47WH). The cause of the crash was unknown, but is believed to have happened during flight training. The crash closed Runway 11-29 between 3:45 p.m. and 5:45 p.m. Runway 02-20 remained open and active during the incident, the Truckee Tahoe Airport said in a statement. The Federal Aviation Administration and the National Transportation Safety Board are investigating the crash. Once released, the wreckage will be stored onsite on behalf of the FAA. Both pilots were transported via medevac helicopters to hospitals in Reno. Both pilots, whose names were not released, were in stable condition.